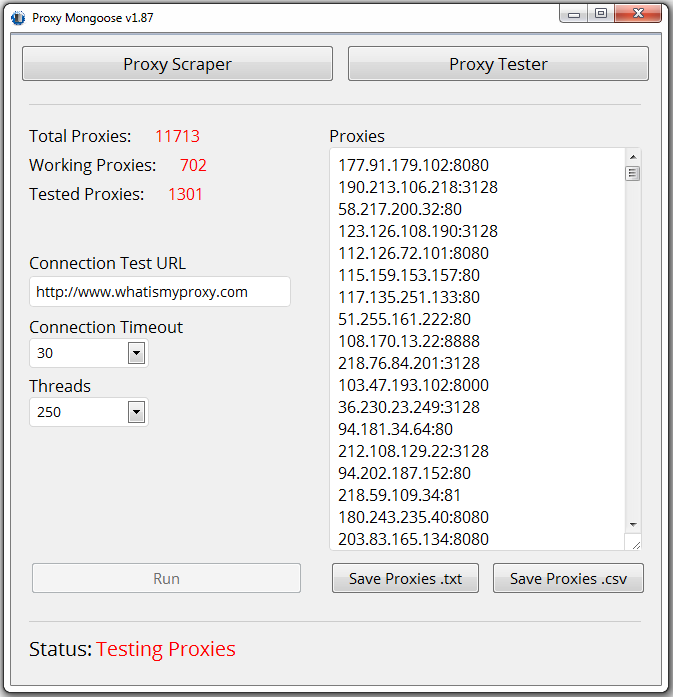 Proxy Mongoose Software - Thousands of Fresh Proxies In Seconds! Need proxies? Then you have come to the right price! You have found the last proxy scraper you will ever need! With Proxy Mongoose you can scrape thousands of fresh proxies anytime you want and it only takes a matter of seconds! It's as simple as opening the program and hitting "Run", that's it! Just sit back and watch those proxies roll in! Free Updates & Customer Support For Life! More Proxy Sources Coming Soon! How many proxies can it scrape each run? This will vary as is the nature of scraping from different websites that update at different times but with all sources selected you should always get 7,000+. You can message me via the on-site inbox anytime and I will get back to you as soon as possible. Proxy Mongoose Software - Thousands of Fresh Proxies In Seconds! is ranked 5 out of 5. Based on 71 user reviews.